Of all the figures lying behind the American psyche, it is strange to me that Goethe's place is as meager as it is when compared to writers like Joyce or even Rilke. As a matter of fact, I'm surprised Goethe was not appropriated into the culture in the manner that Rilke was-as a speaker of soothing words; his writings arranged to have an effect similar to a self-help book. Far more than Rilke, whose world was created through such slow, reflective processes, Goethe had an inflated sense of mission, a pithiness of expression and a gift for sentiments confluent to modern ones where individuality and the kind of self development to which American culture pays lip-service are concerned. It is no surprise Nietzsche revered him so highly, at one point considering him his only contemporary, for they both possessed a great deal of distrust for being. Becoming was their game. Being, for Goethe, was a source of great anxiety. It is evident from his letters, certainly the ones dealing with his romantic relationships, that simply remaining in a state of waiting was a source of great torment for him. Granted, he was capable of seeing certain tasks through with an abundance of energy and devotion to the fruition of his final goals that kept him able to withstand intense discomfort and disagreeable circumstances in the meantime. Despite his intolerance to pain and also the moments in which being might most make itself manifest, despite his love for a few great thinkers who took great pains to reduce the world to a few finite laws, Goethe had great faith in a great many eternal ideas all wrapped up in an absolute. Sifting through Goethe's writings, one could quite easily pick out a few words of inspiration or words to justify every modern prejudice, fancy and commonplace masking itself as a form of rebellion. 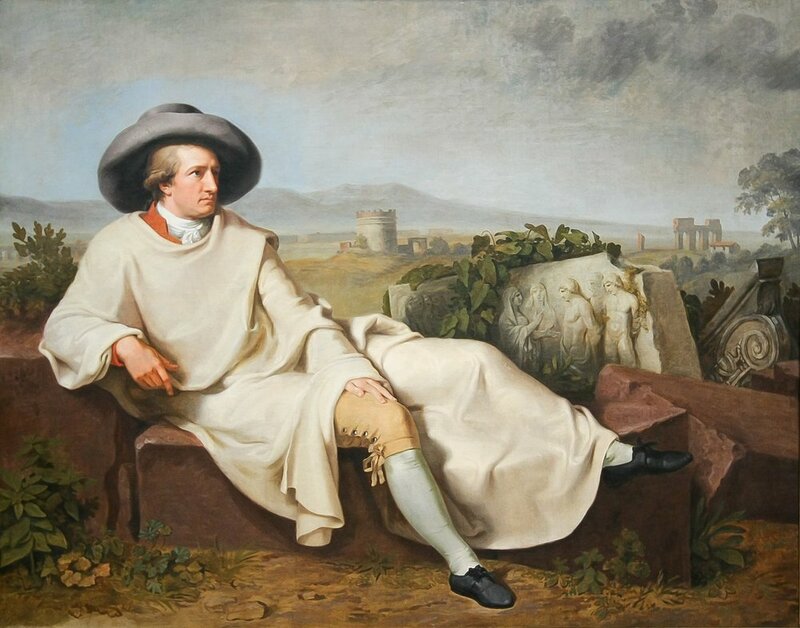 Goethe, among accomplishing many other things, represents a level of Prometheanism stemming from the pinnacle of the enlightenment which has been the most standard vogue in the American intellectual life. America wants its absolute, but it also wants its freedom from it. Goethe's attitude to life can be interpreted as an escape from passion, or passion subdued. The move of passion is needed, as it is in youth, to break from the chains of tradition, if only to allow the individual the freedom to cancel his vices on his own terms. The God that Goethe wanted to become was not Greek, but rather an unknowable, unmovable God. The gods had no traffic with the constraints of human betterment. Immortality made everything a decision of passion. Tagged with friedrich nietzsche, rilke, goethe, the burning block, magazines, invisible totems of the modern world. December 22, 2016 by Shane Eide.